Colonel James Withers Sloss (photo above) was one of the founders of Birmingham, helping to promote railroad development in Jones Valley, Alabama and participating in the Pratt Coke and Coal Company, one of the new city’s first manufacturers. 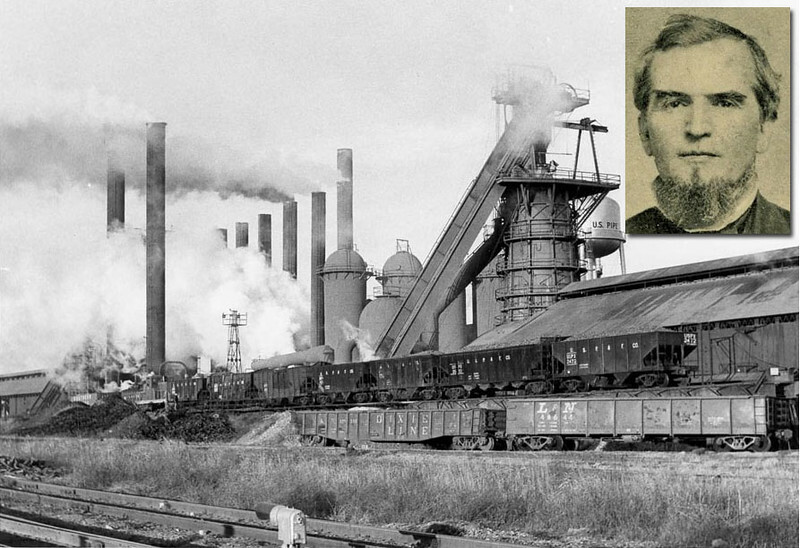 In 1880 he formed his own company, the Sloss Furnace Company, and began construction of Birmingham’s first blast furnace on 50 acres of land donated by the Elyton Land Company for industrial development. The engineer in charge of construction was Harry Hargreaves, a former student of English inventor Thomas Whitwell. The two Whitwell-type furnaces were 60 feet tall and 18 feet in diameter. The first blast was initiated in April 1882. The facility produced 24,000 tons of high quality iron during its first year of operation. Sloss iron won a bronze medal at the Southern Exposition held in 1883 at Louisville, Kentucky. James W. Sloss retired in 1886 and sold the company to a group of investors who reorganized it in 1899 as the Sloss-Sheffield Steel and Iron Company, even though i would never make steel. Eight steam-driven blowers were installed in 1902 which provided air for combustion in the furnaces, and new boilers were installed in 1906 and 1914 which produced steam for the site until its closure in 1970. With the acquisition of additional furnaces and extensive mineral lands in northern Alabama, Sloss-Sheffield became the second largest merchant pig-iron company in the Birmingham district. Company assets included seven blast furnaces, 1500 beehive coke ovens, 120,000 acres of coal and ore land, five Jefferson County coal mines and two red ore mines, brown ore mines, and quarries in North Birmingham. By World War I, Sloss-Sheffield was among the largest producers of pig iron in the world. Between 1927 and 1931, the plant went through a period of modernization, replacing the plant’s blast furnaces and charging and casting machinery with mechanized equipment. James Pickering Dovel, the superintendent of construction developed gas cleaning equipment, modified the design of the furnaces, and improved the lining of the furnaces. Many of his inventions were used when Sloss’s No. 2 furnace was rebuilt in 1927, earning Dovel and Sloss a reputation for innovation. During this period, the company built 48 small cottages for black workers near the downtown furnace which became known as “Sloss Quarters”. In the late 1930s World War II expanded the market for iron and steel and created jobs for Birmingham workers. By 1941 when America entered the war, nearly half the labor force was employed by the iron and steel and mining industries; more than two-thirds of the industries’ workers were African-American. During World War II, a dehumidification plant was built to reduce the consumption of coke, but was never used again after the war. In the late 1940s, two slag granulators were installed to produce the “expanded slag” needed to make structural concrete, mineral wool and other products, and the old steam-driven blowers were replaced in 1949 and 1951 with two turbo blowers. In 1952, the Sloss Furnaces were acquired by the U.S. Pipe and Foundry Company, and sold nearly two decades later in 1969 to the Jim Walter Corp. The Birmingham area had been suffering from a serious air pollution problem during the 1950s and 1960s due to the iron and steel industry there, and Federal legislation such as the U.S. Clean Air Act encouraged the closure of older and out-of-date smelting works. Also, by the early 1960s, higher-yielding brown ores from other regions were feeding the blast furnaces. The Jim Walter company closed the furnaces two years later, and then donated the property to the Alabama State Fair Authority for possible development as a museum of industry. The authority determined that redevelopment was not feasible and made plans to demolish the furnaces. Local preservationists formed the Sloss Furnace Association to lobby for preservation of this site, which is of central importance to the history of Birmingham. In 1976 the site was documented for the Historic American Engineering Record and its historic significance was detailed in a study commissioned by the city. Birmingham voters approved a $3.3 million bond issue in 1977 to preserve the site. This money went toward stabilization of the main structures and the construction of a visitor’s center and the establishment of a metal arts program. Sloss now hosts concerts, festivals, and conferences, as well as workshops and exhibitions of metal art. By helping people form new attachments to the old furnaces, these programs keep Sloss an active and important part of the community, as it was for almost a hundred years.